The Campaign for Clean Air in London (CCAL) warmly welcomes two developments that are together likely to result in substantial and urgent improvements in London’s air quality. First, environmental law and policy organisation, ClientEarth, has launched today a campaign to ensure full compliance with air quality laws in London in time for the 2012 Olympics. Second, the European Commission (Commission) has written to CCAL saying that the air quality plan for London must include ‘multiple abatement measures with a high ambition level to ensure sustainable compliance with limit values’. The time has come for the government and Mayor Johnson to take urgent and adequate action to save lives and more generally protect the health of Londoners. 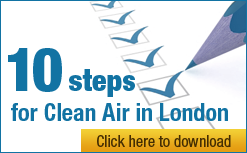 Londoners are encouraged to sign up to ClientEarth’s free membership to demonstrate their support for decisive action to improve air quality. ClientEarth does not believe that the United Kingdom (UK) government is entitled to a time extension to comply with limit values for dangerous airborne particles (PM10). ClientEarth has written today to the Commission [letter to published shortly] explaining in detail why the UK does not meet the preconditions for the time extension that the government seeks and current plans to eliminate breaches of PM10 in London by June 2011 are not credible. ClientEarth is taking legal action to compel the government to comply with its air quality obligations immediately. ClientEarth is encouraging the Commission, whether compliance must be immediate or delayed until June 2011 (if a time extension is granted), to press the UK to submit a credible air quality plan for London. It says that, although the UK is ineligible for a time extension, a credible plan would reduce the need for the Commission to pursue infringement proceedings against the UK and may eliminate the need for ClientEarth to take legal action in connection with the time extension. ClientEarth’s objective is to forge positive changes to improve the lives of all Londoners. Further, it wants to see London become a model for successful environmental change in cities worldwide. If it is successful, the populations of London and the UK will benefit from a valuable legacy following the London 2012 Olympics. Commissioner Dimas asked Philip Owen, Head of Unit, at the Commission’s Clean Air and Transport unit to reply to a letter from CCAL to the Commissioner dated 4 May 2009 which urged further infringement action against the UK over exceedances of the PM10 limit values. The full text of the Commission’s letter appears at the end of this Campaign Update. The Commission has also highlighted a major new initiative, Project APHEKOM (www.aphekom), which has specific objectives related to the communication of information on air pollution and health. “ClientEarth’s commitment to enforce air quality laws throughout London by the 2012 Olympics is much needed. It is astonishing, 10 years after the legislation entered into force and well over four years since the standards for dangerous airborne particles were due to be met that these legally binding obligations have not been complied with. “ClientEarth’s letter to Commission Dimas makes it very clear that the UK is not entitled to a time extension to comply with the limit values for PM10. Wisely, ClientEarth encourages the Commission to press the UK, in any event, to submit a credible air quality plan for London and implement it immediately. Unless there is urgent and adequate action on the ground in London to reverse the mean rate of increase in dangerous airborne particles (PM10) of 0.4% per year since the late 1990s, it seems highly likely that ClientEarth will be able to use the UK’s ineligibility for a time extension to force immediate compliance with the limit values for PM10 to protect public health. “The Commission’s recent letter to CCAL makes clear: it is (rightly) determined to enforce air quality laws to protect public health; it may reject the UK’s time extension notification for PM10 and escalate infringement action (e.g. if parts of London are found in September 2009 to have breached the annual limit value plus margin of tolerance for PM10 in 2008 (i.e. 48 micrograms per cubic metre (μg/m3) or if pollution levels show again an adverse trend); and that an air quality plan for London needs to include multiple abatement measures with a high ambition level to ensure sustainable compliance with the limit values. Thank you for your letter of 4 May 2009 concerning the Commission’s infringement action against the UK over exceedances of the PM10 limit values. Commissioner Dimas has asked me to reply on his behalf. As indicated in our previous correspondence as well as in the Commission’s public statements also quoted in your letter, the Commission is very concerned about the strong adverse health effects due to air pollution. This is why the Commission expects Member States to do their utmost, in the interest of their citizens, to comply with the EU air quality standards in the shortest possible time. The Commission issued the UK with a first warning letter for exceeding PM10 limit values at several places across the UK, most notably in London. In response to the warning, the UK authorities on 5 May 2009 notified the application for an exemption from the limit values for PM10 pursuant to Article 22 of Directive 2008/50/EC for eight air quality zones, including the zone for Greater London. The Commission is now assessing the notification and a request for further information has recently been sent to the UK authorities. It is expected that the assessment of the notification will be concluded within nine months of the initial notification. The pursuit of the infringement proceedings will be considered on the basis of the decision on the exemption, taking into account also the latest information on PM10 concentration levels in the zones and agglomerations concerned. High PM10 and NO2 pollution levels in the London area together with the complex contribution of a number of sources indicate that multiple abatement measures with a high ambition level are required to ensure sustainable compliance with the limit values. In order to benefit from a time extension, the UK authorities will have to identify these abatement measures and demonstrate that the combined impact of the measures will ensure compliance by the extended deadline. The Commission expects that the ambition level thus demonstrated in the notification is maintained during the whole of the exemption period. As regards the quantification of the health impact of poor air quality in London raised in your letter, you are invited to consult the methodology employed in the Impact Assessment of the Thematic Strategy on Air Pollution and the referred studies, all available on the Commission air quality website. Choosing the appropriate metric is linked to the specific communication objective and may differ from situation to situation. Project APHEKOM (www.aphekom.org), co-funded by the European Commission’s Programme on Community Action in the Field of Public Health, has also recently been launched with specific objectives related to the communication of information on air pollution and health. ClientEarth is a company limited by guarantee, registered in England and Wales, company number 02863827, registered charity number 1053988. Further details about ClientEarth can be found at www.clientearth.org. Membership is free and people can tick a box, when they register, to indicate their support for ClientEarth’s CleanAir for London campaign. On 27 July 2009, ClientEarth sent a letter to the Environment Commissioner, Commission Dimas, urging the Commission to reject the UK’s request for a time extension to comply with the limit values for dangerous airborne particles (PM10). Attached to that letter are copies of the 38 submissions to the Department for Environment Food and Rural Affairs on its consultation on the draft PM10 notification.